Freshdesk is one of the three biggest SaaS help desk solutions in the world today. It combines enterprise-grade robust features with plug-and-play simplicity and price scalability. The software is built on seamless organization, collaboration, smart automation, and tight integration to help you deliver excellent customer support. These features, and the vendor’s constant drive for innovation, make the software our top choice in our comparison of top help desk solutions in 2018, and a favorite of businesses of all sizes from big companies like 3M, BOSS, and Cisco to startups. In this article we’ll discuss in details of industry awards won by Freshdesk in 2017 and what they mean to prospective Freshdesk users by highlighting the software’s winning features. Hopefully, this will help you decide if Freshdesk is a solution that can meet specific requirements of your company. You can also easily sign up for Freshdesk free trial here. 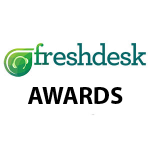 If you’d like to know more about Freshdesk awards, features, pricing, integrations, and other specs, read our Freshdesk reviews. Our B2B expert panel has reviewed top help desk software products analyzing such factors as quality of features, usability, pricing, and customer support, and concluded that Freshdesk is the best in its class. It takes a deserved place in our top help desk software ranking. After a thorough inspection of its functions and subjecting them to scenarios that simulate various customer support issues, Freshdesk passed with flying colors. Freshdesk was also a winner of the Microsoft Bizspark Challenge and a fund recipient of Accel Partners during its startup years, which laid the ground for the vendor’s journey to become a major B2B global brand today. Freshdesk brings together disparate support channels into a single dashboard for seamless organization. 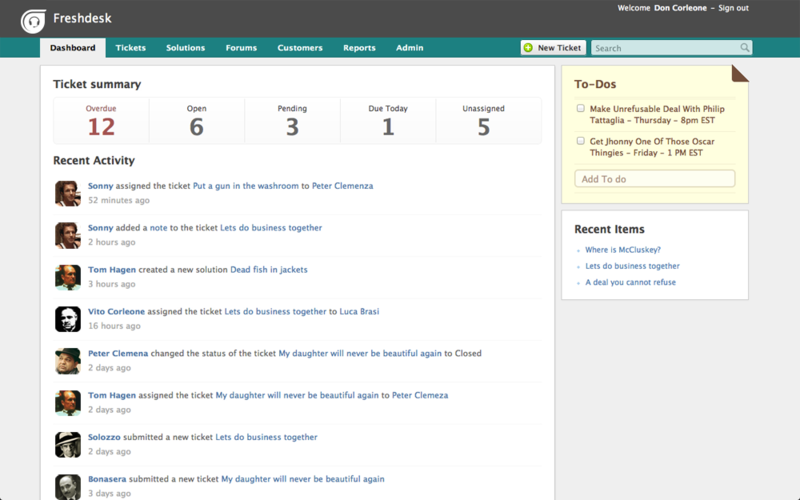 Customer queries can come from phone, email, livechat, social media, and forum; however, all queries are converted into tickets and shown in one place. From here, you can prioritize, categorize, and assign tickets based on SLA or urgency. Freshdesk’s powerful ticketing lets you perform functions right inside the ticket, including view customer details, change status, add notes, and set priority. Likewise, its ticketing allows for quick collaboration between agents, managers, other departments, and suppliers to address difficult tickets, while an agent collision detection prevents duplicating replies. Even if support is swamped with hundreds of tickets, the Team Inbox shows all active tickets. This helps managers to keep tab of each query and avoid bottlenecks or escalations. Our experts noted Freshdesk’s advanced smart automations that allow repetitive tasks to be offloaded from your support team’s daily workload. You can set up canned replies for FAQs. More impressively, you can set up conditions in myriad scenarios. When a ticket meets any of these conditions, the software automatically categorizes, prioritizes, and assigns the ticket. You can add conditions as they fit your workflow. This advanced automation helps you to increase response rate and focus on more critical issues. Freshdesk integrates with over 60 standard and popular apps, especially with business solutions like CRM, sales automation, and ecommerce apps that also deal directly with customers. Using Freshdesk means you can connect to your customer sales history to suggest an upsell or cross-sell. You can also send billing or tech inquiries directly to finance or IT for assistance. Likewise, tight integration with Twitter and Facebook means you’re always a comment or post away with most customers. Our B2B expert reviewers subjected Freshdesk to three main support issues to see how the software performs in real problem scenarios. The Expert’s Choice Award for 2017 means Freshdesk not only passed our tests, but impressed our software reviewers with actual outcomes. First, the software easily organized chaotic online communication. Companies often start their support with a single email address and social media links. However, when our experts tried to handle over fifty queries simultaneously, messages were easily buried and lost and confusion who replied to whom was common. After testing the same scenario in Freshdesk, response time per ticket jumped by as high as 150% and missed tickets were avoided. Second, our B2B reviewers put the software’s collaboration capability to the test. Internal communication is critical in handling difficult tickets that require inputs from other departments or even suppliers. The reviewers found the private notes inside the ticket dashboard a useful feature to exchange communication between agents, managers, and third parties. For example, in one scenario, the agent, upon receiving a bug query, was able to get a response from IT within minutes. This enabled our agent to reply back to the customer under thirty minutes with an accurate explanation of the issue, including a time frame when the bug will be fixed. The same collaboration scenario can be replicated involving other departments, such as, billing, logistics, and sales. Third, our B2B reviewers were impressed with the software’s smart automations. Automation is a common help desk feature, but our reviewers noted that the Freshdesk’ feature elevates automation to a higher level: it can make collaboration run in auto mode. In one scenario, a recurring technical issue (expired license) was sent to an email helpline. Normally, the ticket is automatically assigned to the next available agent, who will contact IT for license renewal. But the software detected the ticket meets a preset condition, which sent the ticket straight to the IT department for license renewal and an auto-response was generated to notify the customer. Again, this departmental ticket crossovers can be replicated with other business units that relate to the ticket. The Verified Quality Seal means Freshdesk offers quality features that are above-industry standards. Its ticketing, collaboration features, smart automations, and gamification are expected to improve the customer support service of prospective Freshdesk users. Likewise, the seal guarantees the vendor’s reliability to provide efficient SaaS support. A helpline, either via email, phone, or self-service portal, is always open for beginners’ queries. The vendor also assigns a client liaison that Freshdesk clients can readily contact. Our B2B reviewers found the software’s depth of features, customization, and integration capabilities to be the main factors that merited the Great User Experience Certificate. Setup is easy and fast. You just sign up with an email address, assign an official help desk name, and start adding agents. Our reviewers estimated that a newbie can learn the basics in one day and master the more advanced features within a week. Pricing is also a factor for the award. You can start using Freshdesk for free for up to 3 agents. Paid plan starts at an affordable $16 per month, while enterprise plan is at $70 per month, one of the most cost-effective pricing in the category. Moreover, Freshdesk is one of the few SaaS companies with global support features. This is very useful for clients in non-English speaking regions, especially in Asia, Latin America, and Europe. Likewise, companies with international support teams will find Freshdesk adaptive to their respective team’s needs. The software support 26 languages out of the box, while it lets you customize for additional languages. Furthermore, you can manage support based on the time zones of your local support teams. You can easily sign up for Freshdesk free trial and assess the software’s main features, including smart automations, robust ticketing, and collaboration functions. Similarly, you get to access the multi-channel features, which make it convenient for customers to contact you through various means: email, phone, livechat, social media, and forum. This helps you to project transparency and empathy–thus, goodwill–to customers, subtly showcasing to them not only that you can be reached any time, but you want them to reach you for product concerns. Our B2B experts also noted that the freemium gives small businesses a chance to improve their support now even as they are growing the business. It is ingenious for Freshdesk to grow its own customer base by helping its clients to grow their respective businesses, too. You can get more information on Freshdesk pricing in our detailed review of the app. After reviewing a wide array of help desk solutions in the market today, our B2B panel of experts concluded that Freshdesk tops this category with its powerful features and excellent customer relations. If you are looking for ways to enhance your customer support, Freshdesk can help you achieve that goal. You can easily sign up for a free Freshdesk trial or start using its freemium to kick start your great customer support.